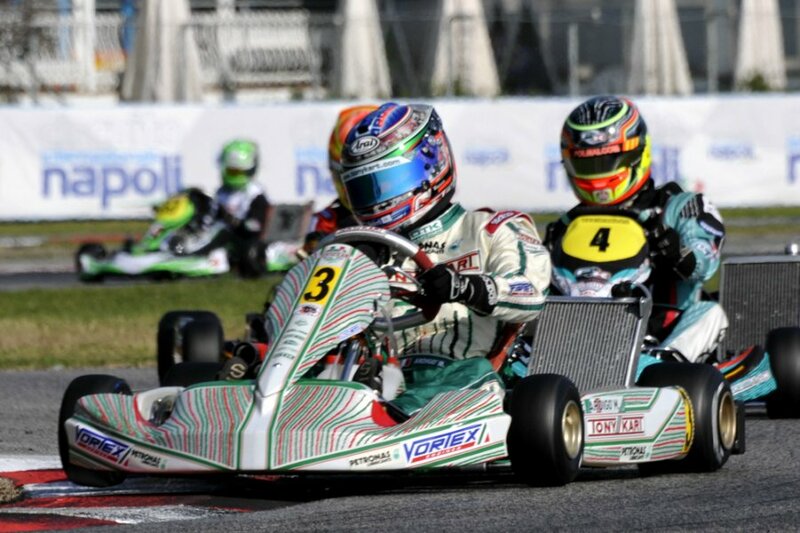 The International Circuit Napoli is ready to host the final phase of the top race in the end of the 2014 karting season: the World KZ Championship is going to award, here in Sarno (I), the last CIK-FIA titles. The Italian Marco Ardigò (Tony Kart-Vortex-Bridgestone KZ) and Fabian Federer (CRG-Maxter KZ2), the Spanish Jorge Pescador (Praga-Parilla-Bridgestone KZ2), together with the Turkish Berkay Besler in the CIK-FIA Academy Trophy, are leading the current standings after the qualifying heats. They are the drivers to beat tomorrow, in the final and decisive phase which is going to be particularly heated. Such an impotant event deserved an appropriate media coverage: the Finals will be aired live by Motors TV, starting from 02:20pm. At the same time, the live streaming will be available on www.cikfia.tv and www.cikfiachampionship.com. The streaming will start at 10:50am with the drivers’ parade. Yesterday Flavio Camponeschi, today Marco Ardigò. The two team-mates swapped positions at the head of the KZ Championship but their opponents are well aware of the competitiveness of the two drivers. The Belgian Rick Dreezen (Zanardi-Parilla-Bridgestone) tried to couterattack in today’s heats. The new European Champion won the third and last heat of the day, while Ardigò won the first two. The Italian seemed to be in great shape, as it always happens when he takes part in a top event. Ardigò laid his cards on the table beating Camponeschi and Dreezen himself in the first heat then, in the following race, he had the upper hand over the Swedish Douglas Lundberg (Intrepid-TM-Bridgestone) and the Italian Mirko Torsellini (Birel-TM-Bridgestone). Dreezen won his heat beating Camponeschi and the Dutch Jorrit Pex (CRG-TM-Bridgestone), achieving the second slot on the Prefinal starting grid, next to the pole-sitter, Ardigò. There is going to be a great battle for the title with Camponeschi and Pex starting from the second row, while Lundberg and Torsellini fill the 3rd row. ‘Crowded’, unpredictable, intense. The KZ2, which awards the CIK-FIA International Super Cup in Sarno this weekend, is a category always full of surprises. Here, the drivers who stand a chance to win the trophy are more numerous than the ones who won today’s heats. Among them, the Italian Andrea Dalè (CRG-Maxter-Bridgestone), eager to bid for the cup after his recent win in the European Championship; the Spanish Jorge Pescador, yesterday’s pole-sitter; the Dutch Menno Paauwe (Birel-TM), who won three heats today as well as Dalè and Pescador. The Italian Fabian Federer and Lorenzo Camplese (Maranello-TM) won two races each, while another Italian, Loris Spinelli (CRG-Maxter-Bridgestone) and the Dutch Ryan van der Burgt (DR-TM-Bridgestone) won once. Taking in account the penalties, it is Pescador who eventually gains the pole position in the Prefinal A, with Paauwe next to him in the front row. The pole-sitter of the Prefinal B is, on the other hand, Federer, with Camplese filling the 2nd slot. The British Martin Ross, the Japanese Hikaru Kogure and the Turkish Berkay Besler joined the Dutch Richard Verschoor, who set the best time in yesterday’s qualifying, winning today’s three heats. In the Pre-final of the Academy, where all the drivers are on Parolin-Fim-Bridgestone karts, Besler will be the pole-sitter, with Verschoor in second position. Second row for Kogure and the Brazilian Murilo Della Coletta.